Check out these tips for keeping your wooden deck looking new all year round. A deck is a great way to add more living space while spending more time outdoors, and is perfect for enjoying beautiful Maryland summers. You want your deck to look new all year round, and now is the best time to ensure it is ready for summer. Continue reading for a few tips on how to keep your wooden deck looking new all year. The first thing to do in the spring or summer is to wash and clean your deck to get it looking brand new again. Maintaining your deck by keeping it very clean is important for preventing mold and moss growth. Wooden decks require different cleansers than decks of other materials, so be sure you use the correct product. Also, you can use a pressure washer to efficiently clean the wood and get rid of all dirt and debris. 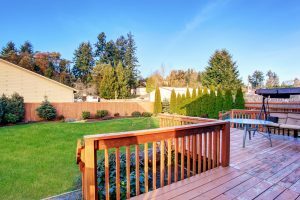 After suffering a few long and cold winters, your deck is likely to need some repairs. The snow and ice can take a toll on the structure, so yearly inspections are necessary each spring. Be on the lookout for loose boards, nails sticking out, loose screws, and rotting wood to ensure they are fixed before they lead to more problems. In addition, inspect the joints, frame, and beam supporting the deck to ensure it is in good condition. After the first initial clean of the season is done and repairs are made, continue performing weekly maintenance on your deck to ensure it remains looking new. This includes trimming nearby bushes and plants to prevent rot and moss growth, sweep away any debris off the floor, and clean up all food and grilling messes quickly to avoid stains. After going through the effort of installing a beautiful new landscape design, a new deck installation is the best way to enjoy your yard as much as possible! A new deck creates a space where you can relax, eat meals outdoors, and host parties for family and friends. Whether you want a sleek and modern deck or something more simple and traditional, the experts at Edward’s Lawn & Home can bring your vision to life! This entry was posted on Thursday, June 14th, 2018 at 4:23 pm. Both comments and pings are currently closed.